The pedal itself is pretty basic: it has a single hinge, a spring return, and a set of metal contacts that pull apart when the pedal is depressed. 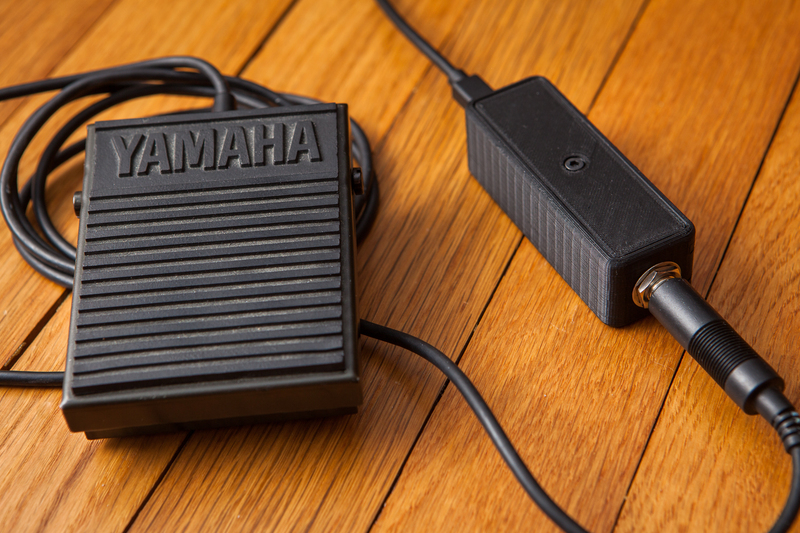 Coming out the back of the pedal is a 5′ cable that leads to a 1/4″ tip sleeve (TS) connector, originally designed to plug into the back of the piano. I can reuse this connection without modifying the pedal itself. The heart of this little adapter is a 1/4″ female TS jack, like the type you would see on the front of a guitar amplifier. I picked up this one from DigiKey for $1.95. Even though the plug only has two terminals, this jack has three contacts on the back. This is because the pedal is a normally closed (NC) switch, meaning that the two contacts on the connector form an electrical connection that is broken when the pedal is depressed. Because of this, you can’t just create a basic adapter that reads on or off; it’s not possible to distinguish between the pedal being pressed (open connection) and the pedal being unplugged (also an open connection). In the table, an ‘X’ indicates that the terminals are electrically connected and a ‘-‘ indicates that the terminal is floating. You can see that the “tip spring” connection is common to both, so this will be our ground. Here’s the same table with the voltage levels. Both the sleeve and tip shunt connections require pull-up resistors for their floating state. I’m going to use the ones built-into the microcontroller. For the case I wanted to make something that was inline with the cable, something that was fairly slim and could be mistaken for an attenuator or a gender changer. The 3D printed design is roughly 85 mm by 30 mm square, which is just wide-enough to accommodate the microcontroller and just long enough that the jack can slide into place. The top cover is retained by a single counterbored M3 screw with threads tapped directly into the case plastic. I printed the case out of black ABS on my 3D printer. The assembled adapter. The microcontroller is held down with some adhesive and the center support keeps it from sliding backwards. I soldered some 22 AWG stranded wire to connect the TS jack and the Arduino Pro Micro serving as the brains of the operation. 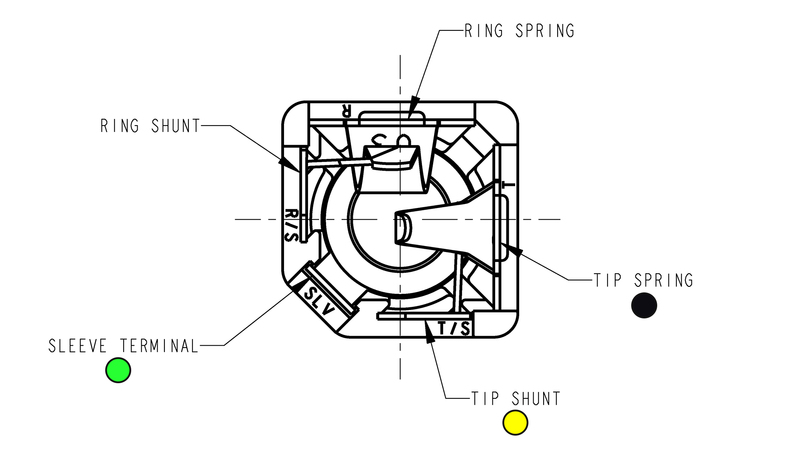 The green wire is the switch detect (“sleeve”), the yellow wire is the connection detect (“tip shunt”), and the black wire is ground (“tip spring”). These wires loop back on top of the microcontroller to give me a bit of wiggle room for installing the parts. The Pro Micro is held in place using a small adhesive strip. 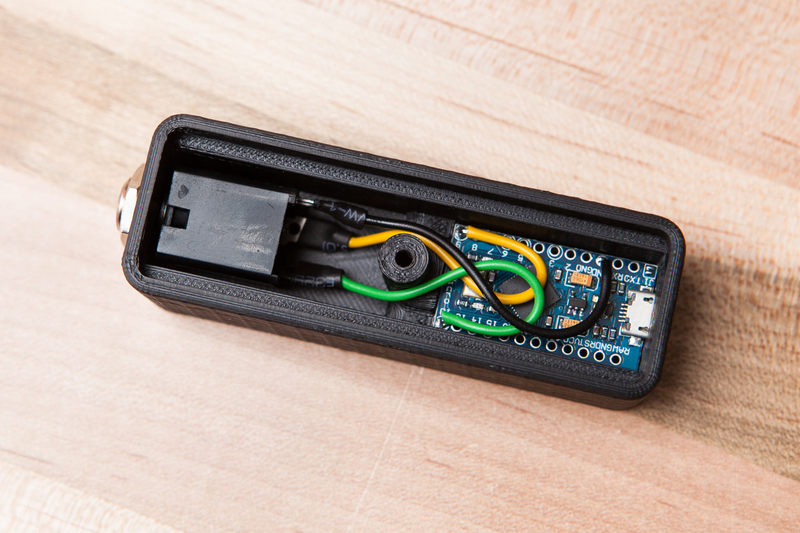 The case design also puts the center bolt support directly behind the microcontroller with a small ledge, which should support it during USB cable connects and disconnects. The program on the Pro Micro is pretty barebones. Since the microcontroller is doing nothing except reading the state of the footswitch, the debouncing is done as hard-coded delays: 100 ms checking for cable connection, 50 ms on plug-in, and 2 ms per successive read. I only imagine using this for things like push-to-talk, so a very slight activation delay is preferable to input spamming. At the moment this footswitch is working with key F23, a virtual function key which isn’t usually used by applications. This allows me to set the footswitch as a hotkey without interfering with any programs or triggering the action accidentally while typing. I’m using the latest version of the Arduino IDE (1.8.5), and as of this writing the included keyboard library does not support these function keys. I’m using the updated version of the library here which supports F13-F24. As with any virtual keyboard, there are two safety checks at the start that prevent keyboard commands from being executed and enable you to reprogram the board if something goes wrong. Conveniently because of the NC switch, the second of these checks will be triggered automatically if the wires inside of the enclosure come undone. // Safety check. Ground pin #2 to stop program. // Safety check #2. Hold button down on startup to stop the program. This only took a day to throw together, but I was really impressed at how solid everything feels and how well it works. The total cost was ~$5, including the used pedal. From what I can tell most of the “PC footpedal” products out there seem poorly built or unreliable, so if you’re handy and have access to a 3D printer this might be a good alternative. I’ve uploaded the STL files to Thingiverse if you’re interested in making your own. This pedal is going to be used for a voice-activated project to enable/disable inputs without touching a keyboard, but I can think of plenty of other crazy uses for it. Stay tuned! You will also need some adhesive strip to hold down the Arduino and a little bit of wire to make the connections. The type of wire doesn’t particularly matter as this is all low voltage very low current. I used some stranded 22 AWG hook-up wire I had handy.